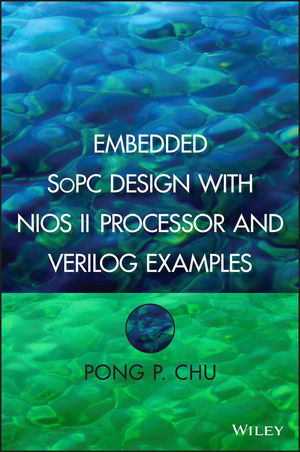 An SoPC (system on a programmable chip) integrates a processor, memory modules, I/O peripherals, and custom hardware accelerators into a single FPGA (field-programmable gate array) device. In addition to the customized software, customized hardware can be developed and incorporated into the embedded system as wellallowing us to configure the soft-core processor, create tailored I/O interfaces, and develop specialized hardware accelerators for computation-intensive tasks. Utilizing an Altera FPGA prototyping board and its Nios II soft-core processor, Embedded SoPC Design with Nios II Processor and Verilog Examples takes a "learn by doing" approach to illustrate the hardware and software design and development process by including realistic projects that can be implemented and tested on the board. Dr. Pong P. Chu is Associate Professor in the Department of Electrical and Computer Engineering at Cleveland State University in Ohio. He has taught undergraduate- and graduate-level digital systems and computer architecture courses for more than a decade and has received instructional grants from the National Science Foundation and Cleveland State University.